Mystery Chinese chess, also known as Cờ Úp, is a fun game playing with a normal Chinese chess set. Unlike standard Chinese chess game where skills alone determine the outcome of the game, Mystery Chinese chess game combines both luck and skills, making the game more unpredictable. Every mystery game is different, and you are unlikly to encounter any two games that are alike. 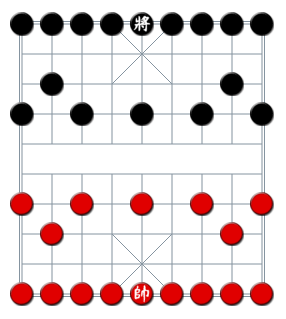 To play Mystery Chinese chess, you first need to know how to play standard Chinese chess (Xiangqi) first. If you are not familiar with Chinese chess yet, please read Chinese chess rules first. Mystery Chinese chess is essentially the same as Chinese chess with modifications to the Basic Rules, keeping the Advanced Rules and Automatic Drawing Rules intact. The game starts with all chess pieces except the King on each side mixed up and turned upside down, turning them into mystery pieces. The King is placed in the normal place in the chess board, and all mystery pieces are placed at random on regular locations on the Chinese chess board. A Mystery piece moves according to its location on the chess board. If its location is that of a rook in a regular Chinese chess board, its initial move is that of a rook, i.e. go straight horizontal or vertically, for example. After the initial move, the mystery piece is turned over, revealing and turning it into a regular chess piece. The King moves only one space at a time, either horizontally or vertically. Furthermore, the King must always stay within the palace, which is a square marked with an X. The Guards (Advisor) move only one space at a time diagonally. The Ministers (Elephants) move two spaces at a time diagonally (i.e. 2 spaces left/right and 2 spaces up/down in a move). If there is a piece midway between the original and final intended position of a minister, the minister is blocked and the move is not allowed. The Rooks (Cars) move one or more spaces horizontally or vertically provided that all positions between the original and final positions are empty. The Knights (Horses) move two spaces horizontally and one space vertically (or respectively 2 spaces vertically and one space horizontally). If there is a piece next to the horse in the horizontal (vertical) direction, the horse is blocked and the move is not allowed. The Cannons move one or more spaces horizontally or vertically like a Rook. However, in a capture move, there must be exactly one non-empty space in between the original and final position. In a non-capture move, all spaces in between must be empty. The Pawns (or Soldiers) move one space at a time. If a pawn does not cross the river yet, it can only move forward vertically. Once crossing the river, the pawn can also move horizontally. Just like in regular Chinese chess, both sides take turn to move their pieces. The game ends when one checkmates or stalemates the other side, or both sides agree to draw the game. The game may also end according the regular Advanced Rules or the Automatic Drawing Rules.